FM linked with University. 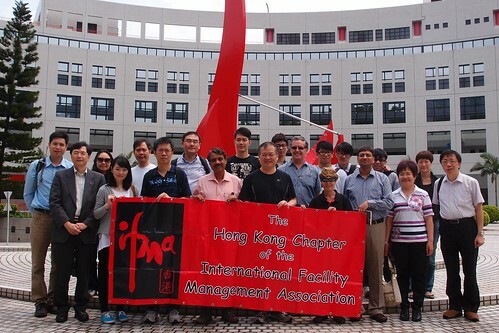 Mr. Mike Hudson, Director of the Facilities Management Office, HKUST has provided a wonderful presentation and Senior Manager Dr. Samuel has arranged a facilities walk for IFMA HK Chapter on 11 May 2103. During the presentation section, Mike showed the “FM input to cope with the changing Academic and Research needs for the University”, as well as the Master Plan of HKUST on-campus and off-campus development. On-campus development including the Lee Shau Kee Campus, the Institute for Advanced Study, extension to the existing Academic Building. Off-campus development including HKUST Fok Ying Tung Graduate School at Nansha and HKUST Shenzhen Industry. Apart from those new facilities and developments, he also shared the successful FM strategic for HKUST through Recapitalisation, Performance Management and Benchmarking to realise the visibility and positive results to customers. Thanks a lot to Mike and Samuel for this valuable talk and visit to IFMA HK Chapter.